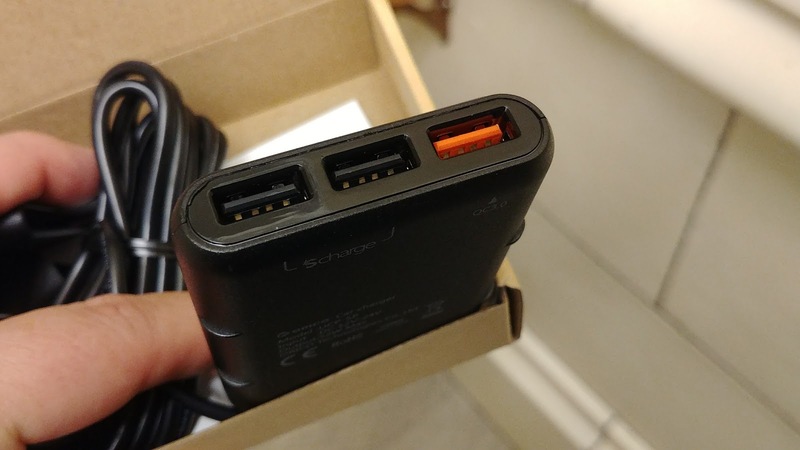 So, once you get one QuickCharge 3.0 compatible charger you gotta start getting more. Charging that quickly is a real treat, and it spoils you. I have one at the house... I should get one at the office, but I'm loving Qi dock which it sits in all the time, so charging isn't an issue there. So, best to look for a replacement for my car charger. 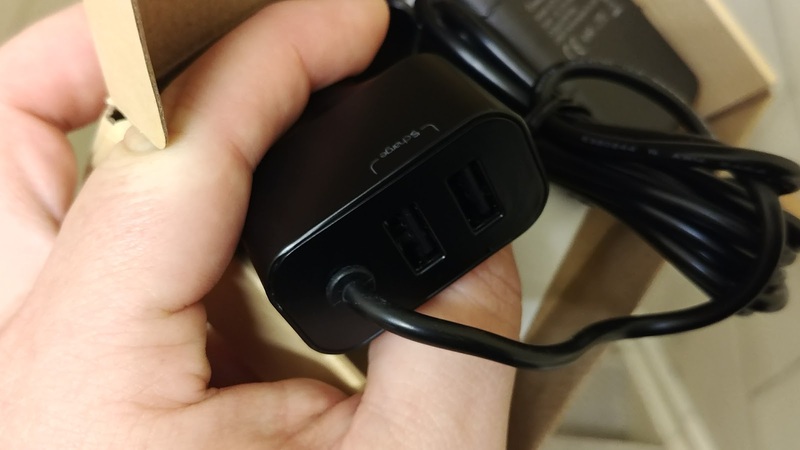 My QC 2.0 charger got crushed recently moving things around in the car so I definitely needed a replacement. 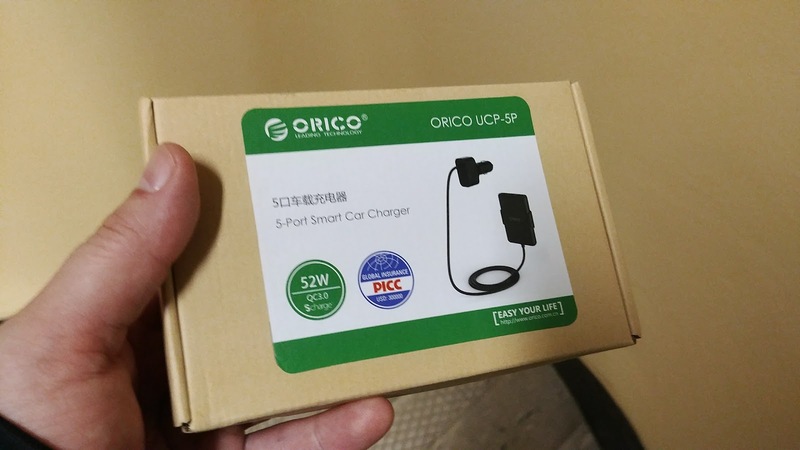 Now, I can't just get anything ... 'normal', so what caught my eye was this car charger from Orico for just $19CDN. It's got not one, not 2, but 5 USB ports on it. You couldn't plug them all in to one little charger, so they have the main plug (with 2 plus that have 2A output) and then it's connected to a 'remote hub' that has 3 more. One of those is QC3.0. This is neat as I'm looking to take another little trip with some folks and having a little charging station for those in the back seat would be handy for them. So, setting it up in the vehicle is quite the challenge actually. You can connect the plug on the dash ... run the cable (thankfully they give you a pretty long cable, ~6ft) to something to clip the 'pack' to the back of your seat. The only problem is that that would leave the cable for QC3.0 at the back seat area ... but I want it. And it felt a little weird running a cable all the way to the back only to just run a cord back to the front for me. The option is I have 12V port right near the back of my console. So I can plug in there, run a short bit of cable to clip it to the back of the seat. Not ideal, but it works. The other option is to keep it plugged in the front, and keep the little pack in a little 'nook' I have in my dash area. Again, not clean, but it's simple. I'll try it both ways for a few days and see what I prefer (I think I'm liking the first option... leaves the plug in the front for other things, like my FM transmitter or charging one of my portable batteries).